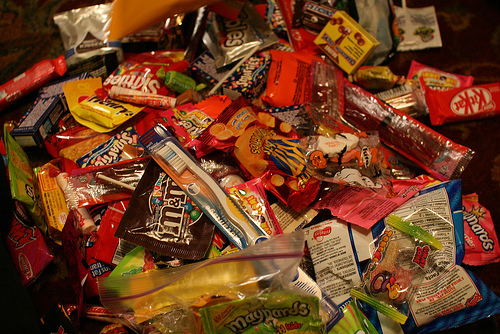 While handing out Halloween treats last night, I got engaged in a Twitter conversation about favorite treats, numbers of trick or treaters and the ingredients in the candy. 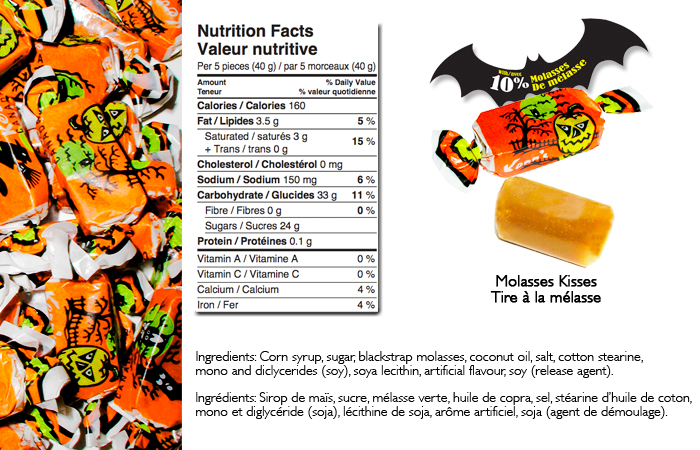 This led to a little detective work on the ingredient labels on many of the treats. Amongst the dozens of additives and preservatives, I discovered two things that were completely unexpected - beetles and bones! Not surprisingly, the classic staples are loaded with sugar, coloring and other food additives. Many have more than 15 ingredients. Huffington Post’s David Katz, M.D., director of the Yale Prevention Research Center says to look for "ingredients we know, recognize, can situate in some part of the plant or animal kingdom, and can pronounce." When it comes to Halloween candies, he suggests combing through your kids loot and keeping stuff with five ingeedents or less. Good luck, the Huffinton Post didn't find any that would pass the five-or-fewer test. Candy corn have 14 ingredients and Reese's Peanut Butter Cups with 13. Whoppers, Butterfingers and red licorice all have more than 15! We had a good turn-out last night. The kids stopped knocking on the door around 9:00. Some people say the numbers were down over past years. 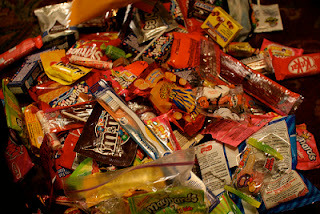 I think that junk like chips and candy are available all year round and the treat collection is not as special as it was in my youth. We never had access to chips, pop and candy like kids do today. It really was a treat! Although, I have memories of little brown bags full of spearmint leaves and a filling to show for it. As well, I loved root beer flavored bottlecaps. For the record, my favorite treat is the traditional Kerr's molasses kisses.